"All men are created equal," said Thomas Jefferson rather famously, presumably intending to include "and women" if only he hadn't spilt his morning tea over that bit of his cue cards. But does the same apply to beers? Or are some beers greater – whatever that means – than others? For the purposes of this, and future articles in this new series, we're going with: "Yes, some beers are greater – whatever that means – than others." The series is The Story Of... and will see us select beers that have gained iconic status, possess particular interest, or are simply downright awesome, and then delve deeper into their background than we do with our usual beer write ups. First to feature is Feral Brewing's Watermelon Warhead, the sort-of-a-Berliner Weisse, barrel-aged, watermelon sour that debuted with the People's Choice award at GABS 2012 and, last year, took out Champion Australian Craft Beer at the Craft Beer Awards as well as gold medals everywhere else. The brewers have been stockpiling supplies since last year ready to unleash the biggest release of the beer to date across the country in the coming days – and they plan to have the beer available year round for the first time too. All of which seemed like as good a collection of reasons as any to pose a bunch of questions to the lovely folks at one of WA's very finest. And if they weren't enough reasons, who doesn't want to see another photo of brewer Will Irving in short shorts, legs akimbo? It was first brewed for GABS in 2012. At the time, making a beer for GABS was a bit like competing in an arms race among brewers: all trying to make beers that were stronger and more bitter and hoppy than each other. We took a different direction and made a low alcohol (2.9 percent ABV), low bitterness (6 IBU), intensely sour beer and tried to put a bit of the Swan Valley into it. 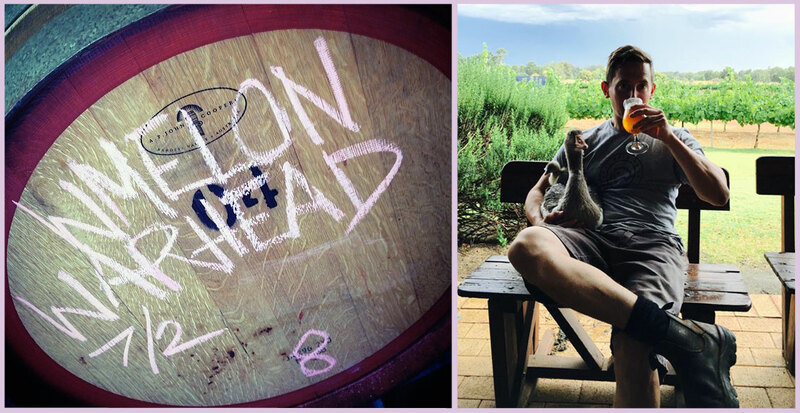 We sourced some used Chardonnay barrels from a local Swan Valley winemaker to ferment the beer in and, with most of WA’s watermelons coming out of the Swan Valley, that was an obvious fruit to use. Not really. It most often get pigeon holed as a Berliner Weisse as the end result ended up similar to that beer style but we didn’t have that in mind as we went about constructing the beer. How many brews did you have to do before Watermelon Warhead was Watermelon Warhead? We were happy with it on the first batch. This rarely happens but we had a lot of experience working with bacteria and barrels in previous years, so the lessons learned from dumping countless barrels of beer previously had given us some insight into how we would zero in on what we wanted to achieve. What is the process that goes into making each batch? And who prepares the fruit? The brew day is no different to any other, however we ferment and sour the beer in used wine barrels. We use lactobacillus to achieve the desired sourness and ferment out with a fairly neutral ale yeast. We then juice a tonne of watermelon and add towards the end of ferment which takes four staff five hours of cutting, juicing, cleaning and pouring. 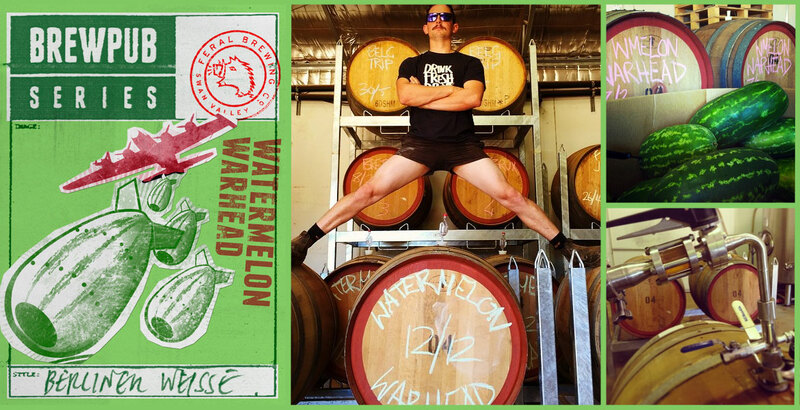 What experience did you have with barrels before brewing Watermelon Warhead? We had three years of producing Funkie Junkie and Dark Funk in barrels before Watermelon Warhead came out. The learning curve of dealing with barrels was a tough one. Initially, we were dumping anywhere from 30 to 50 percent of the barrels we would fill. Our rate of loss reduced the more we understood and refined our processes. Where do you source the barrels and the watermelons from? We have a local family farm a few hundred metres away that's happy to swap a few cartons for a few bins of melons. He is so picky about the melons being perfect that if there is a blemish or odd shape it then it's considered “seconds”, so we will never be short of melons. Feral brewer Will Irving says: "You'd have to be quackers to drink anything else." Purely from the 90s lolly Watermelon Warhead. The only unique thing around the name of this beer is that for the first time ever the beer was named before it was made so our brewing challenge was to match a name that people would be have a preconceived idea about. Usually we have a beer made and ready to go on tap before we remember it needs to be named. The beer hasn’t changed over the years, just our process and procedures to make it more efficiently. This is something we have really improved on. We now get three batches of Watermelon Warhead from each lactobacillus inoculation, then we kill everything in the barrel with heat and sulphur, then re-pitch a fresh culture of lacto and repeat. It's fine to keep going with the previous culture but out in the valley there are a lot of natural yeasts floating about and we want to keep control of what's growing in our barrels. What expectations did you have for the beer when it was first entered at GABS? We take all of our GABS beers pretty seriously. They are never one-off, not to be repeated affairs. Our brief for Watermelon Warhead was sweet, sour, crisp, dry and spritzy in a low ABV; now, we thought that sounded like a pretty appealing set of flavour descriptors. Who wouldn’t love it? All kidding aside, internally we thought it was going to be a love/hate beer, but we enjoyed it and so did most of the punters. We had the token lemon face reactions but never thought it would evolve into some kind of cult following. We had countless emails asking us where and when it was going to be available after that event. It was very unexpected. Do you think it has played a role in popularising sour beer in Australia? Back when we first released Warhead, there wasn’t much in the way of locally made sours or imported sour beer being sold in Australia so I guess the simple fact that we made it helped. These days most good bottleshops have some form of sour beer section. The best reaction was at GABS 2014 where some lass ran from the front doors at opening time of the first session on the first day straight to our stall and asked, out of breath, if we had any. The worst is inappropriate to print. Thanks, guys. Look out for lots of Warhead in lots of places in the coming weeks. And, by the sound of things, forevermore afterwards.